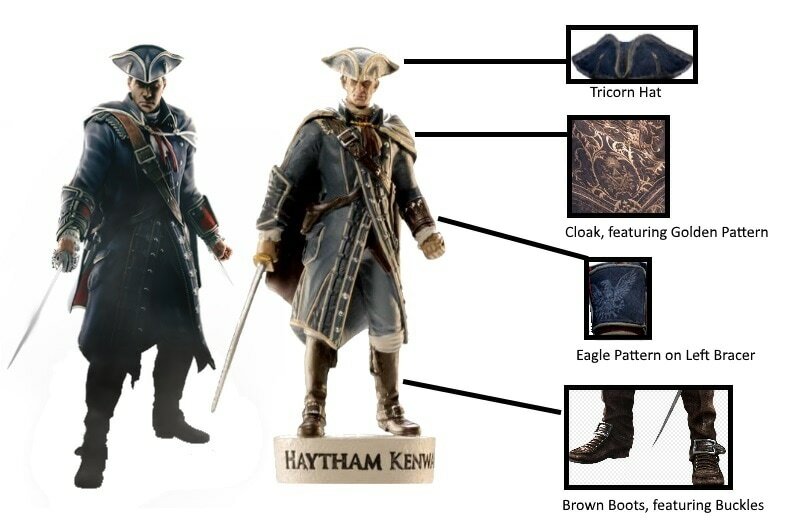 The Haytham Kenway Figurine accurately reproduces the Templar Robes worn by the Grand Master in Assassin's Creed III, Rogue and Forsaken. Haytham's left bracer features an eagle, which is a callback to his name, which means "Young Eagle". One detail that impressed me was that on his right bracer, you can see the outline of a broken Assassin Insignia. I was pleased to see that the back of Haytham's cloak features the distinct golden pattern that features a number of symbols, as seen in the games. Haytham's Tricorn Hat is perfectly shaped, and correctly features the three silver buttons on each side. Another detail that I noticed is that Haytham's trousers are rolled up and tucked into his boots, anotehr accurate feature. This figurine has Haytham holding a Short Sword, which he eventually loses in a dual, after which he switches to a Sabre. I really like the colouring of the Templar Robes, and the positioning/length of the cape. As Haytham is the only Kenway to appear in all three games of the Kenway Saga, it is fitting to see him recreated in Figurine Form for Collectors. We start issue #3 with an overview of the Haytham Kenway Figurine, and a brief overview of his traumatic childhood, which saw his father murdered and half-sister kidnapped in the same night. This resulted in Haytham being raised by Reginald Birch, The Grand Master of the British Rite of the Templar Order. Haytham's task appointed to him by the Templar Order is also mentioned, and his relationship with a native woman that led to him having a son he hardly knew. The "Character Profile" section focusses on Haytham's journey through life, and shows how a young boy's life changed forever when his family is ripped apart, sending him on a different path entirely. His induction into the Templar Order at age 19 initially saw him pursue several targets as an assassin. Three years later, Haytham and Birch searched for Edward's killers and Jenny's kidnappers, in the hope that she could be rescued. This section also details how Haytham is tasked with expanding the Templar Order in the New World, and ythe steps he took in advancing the position of the Order. The next section titled "Friends and Enemies" focusses on the men Haytham recruits when he arrives America. Charles Lee, William Johnson, Thomas Hickey, Jonathon Pitcairn and Benjamin Church are all listed here. All of the characters and their backgrounds are listed in this section, providing an interesting overview of the Colonial Rite. Something I learned from this section: The residents of Connor's village call Charles Lee "Ounewaterika", which means "Boiling Water", due to his cruel temper. This section also features Kaniehtiio (Ziio) and George Washington. Haytham's relationship with Ziio is expanded upon here, and her tragic fate which leads Connor on a violent path. The Ambitions of George Washinton that are not remembered by George Washinton are briefly described here, and his role in the burning of Native Villages, including Connors. The Environments section focusses on the many different places that Haytham's quest leads him to. The first environment is the Theatre Royal, where Haytham assassinates Miko and steals the Grand Temple Key. Next is The Providence, the merchant ship Haytham uses to reach Boston and escape the Assassins. Surviving a potential mutiny and Assassin ambush, Haytham spends 72 days on the ship. The next environment is The Green Dragon Tavern, the base of operations for the Colonial rite. It was also used by The Sons of Liberty and several other important political factions. The Boston Massacre on King Street and the events that take place are detailed. Connor's attempt to keep peace is quickly undone by Haytham and the Templars, as several civilians are shot in the street. Fort George, where Haytham is eventually killed by Connor is also listed. Connor goes to the Fort in an attempt to assassinate Charles Lee, but instead finds his Father waiting for him. A tragic end between father and son leads to Charles Lee becoming Grand Master of the Colonial Rite. The last environment is The Grand Temple, the precursor structure build by The Ones Who Came Before to house research. The structure was first hinted at in Assassin's Creed Brotherhood, when Ezio and Da Vinci find coordinates leading to the Temple. Ezio also finds Templars in Revelations searching for its location. Originally a research facility, in which Juno, Jupiter and Minerva used to prevent a massive solar flare from destroying the planet, the Grand Temple was proteted by the Kanienkehaka tribe for centuries. Precursor Technology and Connor's journey (guided by Juno) are also detailed here. I found the Haytham Kenway Magazine to be very interesting. 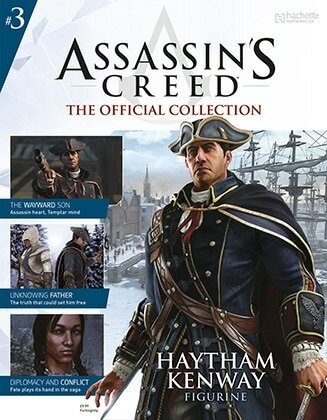 The only things that could have been added to improve the magazine would be the additions of Haytham's actions in Rogue (Meeting Shay etc), and his friendship with Digweed, as detailed in Assassin's Creed Forsaken.